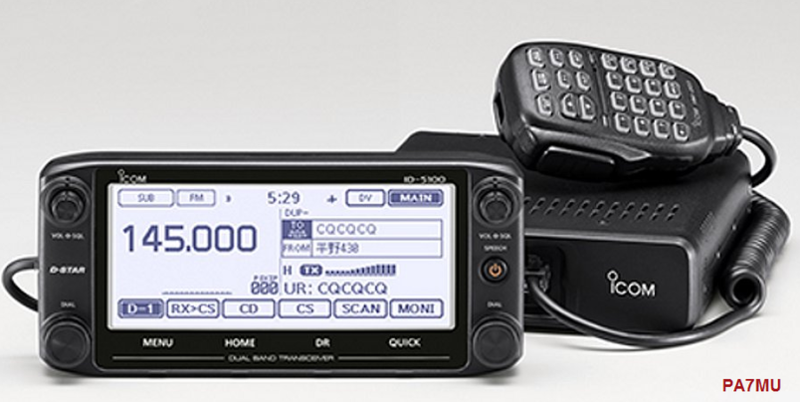 Osaka Hirano, president of Icom Inc., recently announced a new VHF/UHF D-Star transceiver, the ID-5100. Two versions will be released at the end of February 2014: a 50W version, the ID-5100, and a 20W version, the ID-5100D. According to the preliminary specs this will be true dual-band radio with two separate VFO’s. This makes it possible to receive two signals simultaneously, and it doesn’t matter if the signals are analog or digital – any combination is possible. First seen on the IC-7100, now migrating to other models too: a touch panel. In an era where color touch screens are default on almost any device, Icom’s black & white screen seems a bit odd, out of place even. Readability seems to be good though. An interesting feature is “Nearest Repeater Search”, which acts a bit like the roaming function we know from cell phones and DMR radios. Strangely, this only works in analog mode. With the help of an Android app it’s possible to control this radio from your Android device and (if my limited Japanese language skills didn’t let me down) even use it to make QSO’s. No word on iPhone support. You can use a Bluetooth headset to operate the ID-5100. The necessary UT-133 interface and VS-3 headset are options, not standard.